Russian President Vladimir Putin attends a meeting during his visit to Far East Zvezda Plant in Bolshoy Kamen, about 20 kilometers (12 miles) from Vladivostok, Russia, Tuesday, Sept. 11, 2018. Russian President Vladimir Putin is hosting his Chinese counterpart at an economic forum in the far eastern port city of Vladivostok today as armed forces from both countries descend on eastern Siberia to launch Moscow's largest-ever military drills. Russia's week-long deployment alongside Chinese and Mongolian troops, known as "Vostok-2018" (East-2018), comes at a time of heightened tensions between Moscow and the West over accusations of Russian interference in Western affairs and ongoing conflicts in Ukraine and Syria. Comparing this week's show of force to the Soviet Union's 1981 war games during which between 100,000 and 150,000 Warsaw Pact soldiers took part in "Zapad-81" (West-81)—the largest military exercises of the Soviet era—Russian Defense Minister Sergei Shoigu said these exercises will be even larger, with 300,000 soldiers, 36,000 military vehicles, 1,000 planes and 80 warships taking part in the drills. China's participation in the quadrennial war games, while comparatively modest with only 3,200 men and 900 weapons units, is also unprecedented, leading some to view it as an unequivocal warning to the United States and Europe. "It sends a signal to Washington that if the U.S. continues on its current course by pressuring Russia and imposing more sanctions, Russia will fall even more into the firm embrace of China, America's only strategic competitor in the 21st century," Alexander Gabuev of the Carnegie Institute in Moscow recently told The Associated Press, adding that Beijing's participation indicates that Russia and China no longer view each other as military threats. Other experts, however, disagree, questioning both the transparency of Vostok-2018 troop estimates and the political significance of China's inaugural participation. "Numbers and figures for these kinds of exercises are typically what we might call to be true lies, in that they're statistical lies whereby the Russian army's General Staff tallies every single unit-formation that either sends somebody to the exercise or has some tangential command component in it," said Michael Kofman, Russia and Eurasia security and defense analyst at the Washington-based Kennan Institute. "This basically means that if a brigade sends one battalion, then they count the whole brigade," he told VOA. "So these numbers are not entirely fictional, but you have to divide them by a substantial amount to get any sense of how big the exercise actually is." Chinese President Xi Jinping gestures as he arrived at Vladivostok, Russia, to attend the Eastern Economic Forum, Tuesday, Sept. 11, 2018. Different methodologies for calculating troop numbers further complicate efforts to obtain precise figures. "It's very hard to tell beforehand just how big these exercises are going to be," said Jeffrey Edmonds of Arlington-based CNA Analysts. A former Russia director for the National Security Council and CIA military analyst, Edmonds told VOA that while some observers may tally only uniformed troops, others might include deployment of military-civilian reserves. "It could also be, you know, 'Is perhaps this other unit that's operating along the Western front actually part of the operation in the East?' Maybe it is, maybe it isn't. So, different people can come up with different figures." The purpose of the nearly week-long drills, however, is unambiguous. Like top NATO officials who have denounced Vostok-2018 as an "exercise in large-scale conflict," multiple experts described the event as a first-of-its-kind rehearsal for a post-Cold War global confrontation. "The point of the exercise is really to test Russia's ability to conduct a large-scale conflict, and one that may involve a nuclear component," Kofman told VOA. "It's also designed to stress-test the entire Russian political-military network in terms of mobilization, dealing with reserves and assessing how civilian-military authorities would react and respond in the event of a large-scale conventional war." Despite the seemingly more imminent risk of conflict across eastern Europe—Baltic nations have been on high alert since Russia's 2014 annexation of Crimea, and some 2,200 Ukrainian, American and NATO soldiers recently conducted drills in western Ukraine—the Russian military's Achilles Heel, geographically speaking, lies to the far east. "The far east is unique compared to the other [Russian] military districts because it is so distant from Russian infrastructure and population centers," said Kofman, who described Russia's sparsely populated eastern military jurisdiction as "designed and intended to fight as its own, almost separate military, which is why it has so many ground-force formations. "That's another part of this exercise: to test how well that district can hold a potential fight and be reinforced from the central military district in the event of a large-scale conflict or horizontal escalation against Russia," he said. "That even though much of the security conversation on Russia is focused in Europe, the majority of U.S. power projection and most of America's strongest allies are in the Asia-Pacific region." 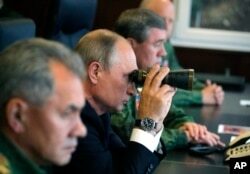 Russian President Vladimir Putin, center, Defense Minister Sergei Shoigu, left, and Chief of the General Staff of the Russian Armed Forces Valery Gerasimov, right, watch a military exercise at a training ground at the Luzhsky Range. Although Russia and China have increased military-to-military contact in recent years, annually engaging in smaller snap military drills, few analysts equate Chinese participation in Vostok-2018 with the emergence of a formal military alliance between the two countries. "Russia has no chance of a formal military alliance with China, and not because Russia doesn't want it," said Moscow-based military analyst Aleksander Goltz. 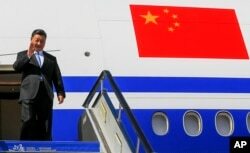 "This China very clearly and resolutely refuses any military alliances and commitments. And while Beijing may be ready to develop some military cooperation with Russia, as well as with other members of the Shanghai Cooperation Organization"—an economic and security pact between China, Russia, Kazakhstan, Kyrgyzstan, Tajikistan, and Uzbekistan—"it is only in very limited ways and defined by Beijing parameters." Edmonds described Vostok-2018 as part of Russia's ongoing efforts to modernize its forces. "Maybe the announcements of how big it's going to be is a reaction to hostilities with the West, but the actual exercise itself is a pretty standard Russian military activity," he said. Kofman, too, suggested China's involvement has less to do with emerging geopolitical dynamics than with practical regional necessities. "If you're going to do large-scale military exercises like this today in the far east, especially when considering Russia's set strategy of trying to form a balancing entente with China on the basis of mutual antagonism toward—and shared security concerns about—the United States, the only logical course of action is to invite the Chinese to participate in this exercise," Kofman told VOA. "Otherwise, [China would] inherently view this exercise as having to do with them, or at least they would be suspicious. "Another part of it, of course, is that both sides are signaling to the United States that their military cooperation is not only growing but that their individual bilateral problems in their respective relationships with the United States are driving them toward greater cooperation, which is definitely not in America's interest," he added. "So, the joint military exercises are not necessarily signs that some sort of formal alliance is forming, but these are incremental steps, so it's important to view them in aggregate." Which is to say, he suggested, the longer term trend-line of Russian-Chinese cooperation may reveal more than the drills themselves. "Over time, an entente between these two countries could be more likely to become a reality than not." Wire news outlets have reported that Vostok-2018 will see Russian forces field Su-34 and Su-35 fighter planes, T-80 and T-90 tanks, and nuclear-capable Iskander missiles. At sea, the Russian fleet is expected to deploy several frigates equipped with Kalibr missiles that have been used in Syria. Last week, Russia held military exercises in the Mediterranean, where more than 25 warships and some 30 planes took part in the drills, as Russia increased its military presence in Syria where it intervened to help the Bashar al-Assad regime in 2015. Upon publication, NATO officials were still weighing Moscow’s invitation to send observers to the drills, which will wind down September 15. The Russian president is scheduled to observe the drills after the Vladivostok forum, where Putin, President Xi Jinping and other regional leaders are expected to discuss trade and North Korea. This story originated in VOA's Russian Service. Yulia Savchenko contributed original reporting. Some information is from AP and Reuters.